The River mouth fishing is well worth a try of an evening with the onset of the spawn run. 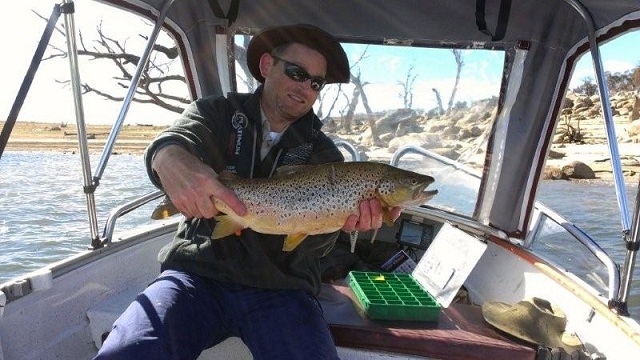 Large streamers like a Fuzzy Wuzzy or Woolly Bugger on a slow sink or sink tip line are a great way to get amongst some big Browns. Best places to fish is at Providence at the Mouth of the river yes there are some good fish starting to move up we have had some rain so this will get the fish moving. 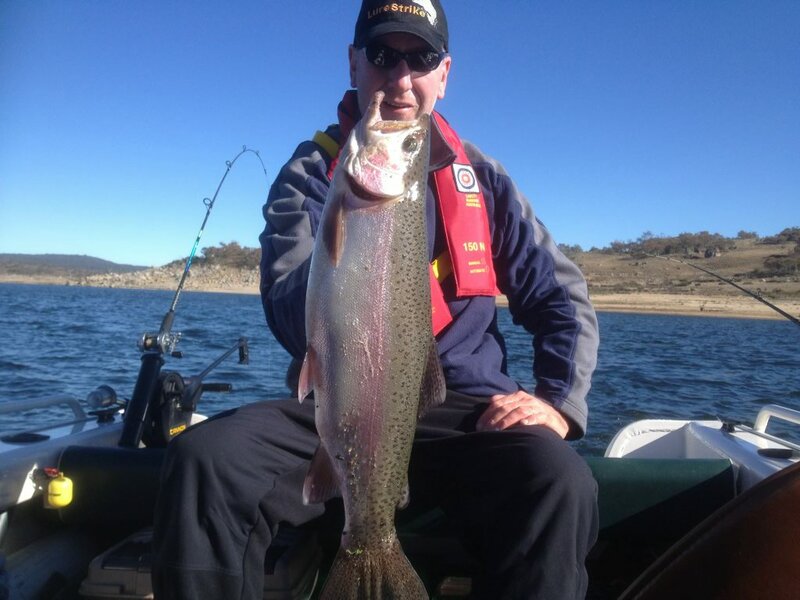 Lake Jindabyne:- Reports from Jindabyne have been scarce but evening and early morning should be a good time. 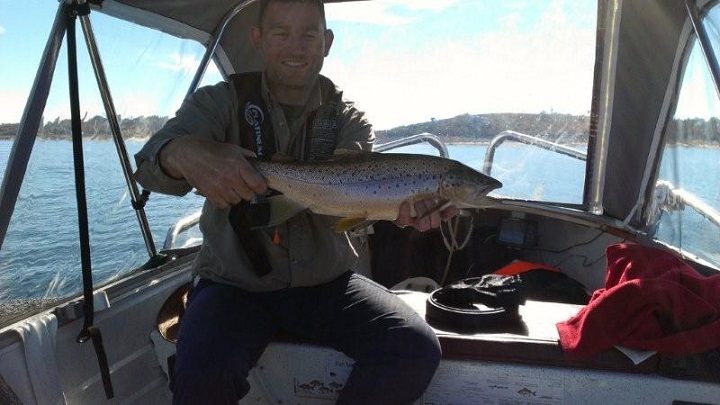 Up around Kalkite we have been getting good reports and around Waste point around the snowy side some good Browns and a few Rainbows Best wet flies are woolly Buggers Black, Brown and Mrs Simpsons have been working well. a few nice fish landed on trolling with all in extremely good condition. Nothing on bait or spin. Here are a few fish snaps. 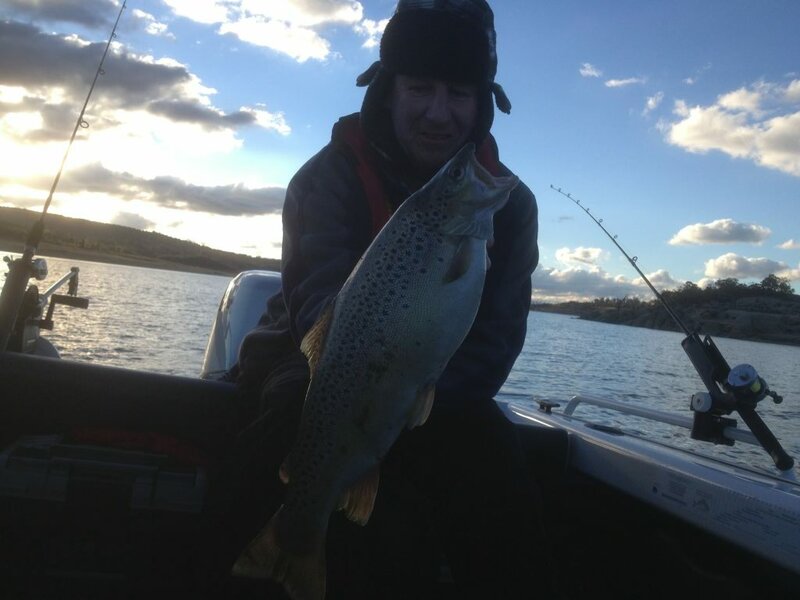 The 6lb brown was caught by Ian trolling in Wianui Bay on Tassie 114, Ginga Niga on Anzay day at about 11am. 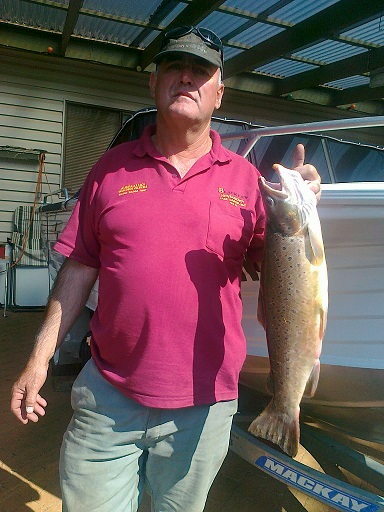 The 1 ½ lb rainbow was caught trolling by Stuart in Rushes Bay Saturday morning on Tassie 115, Rusty’s Banana at about 9am. 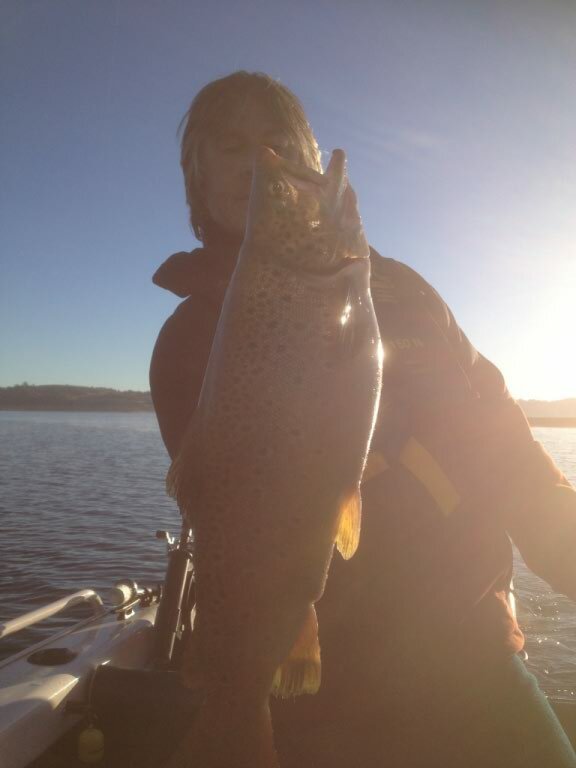 The 4 ¼ lb brown by Ian trolling by Ian in Wianui Bay on Tassie 115, Rusty’s Banana on Anzay day at about 11am. 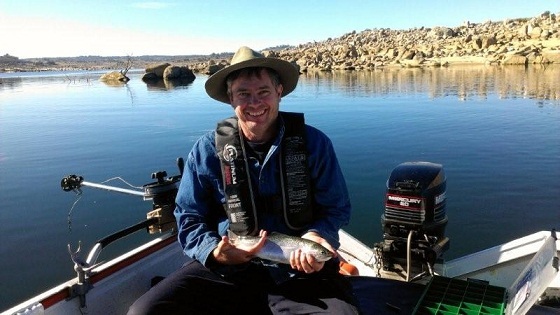 Very nice fish in excellent condition. Pretty slow going but worth the reward. Ian Duncan & Stuart Pazzalaqua. Traralgon, Vic. 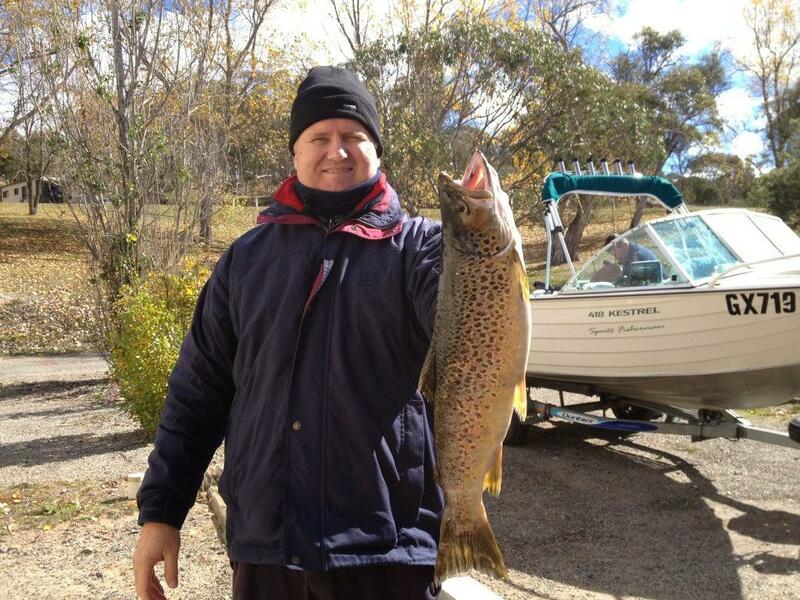 Here are a few Snapshots of some of the fish that we have Caught Trolling at Buchenderra over the weekend . Fishing has picked up over the last few weeks the water temperature is dropping there has been no real pattern on times but what I can tell you is that when they are catching them it usually is only for 1 - 2 hours and then they go quite again. Wainui bay has been doing alright in the morning where as the Middlingbank arm has been in the afternoon. The size and quality of the trout has been fantastic very healthy looking up to 7lb. 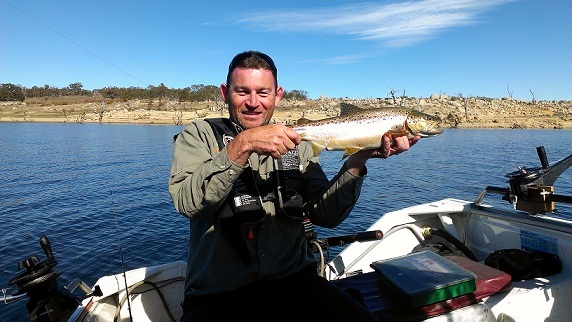 Trolling with yellow wing Tassie devils has been great as well as with Frog Pattern Kwikfish. Even throwing a line in with Power bait lime twist and sherbet burst has been good with the kids and flies I have heard mud eye patterns are still doing the job. I have attached a photo of a nice one caught with Frog Pattern Kwikfish. 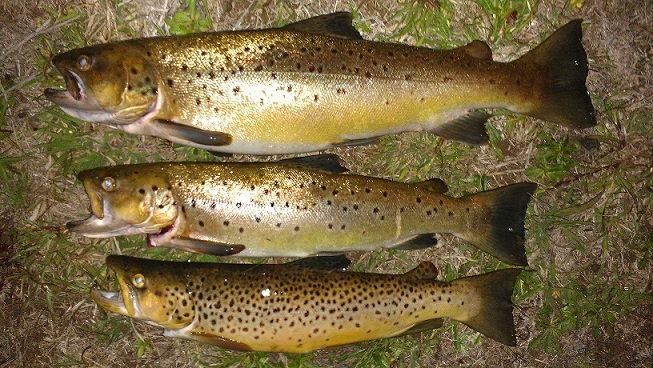 3 brown trout caught just after dark on the 24th May,largest around 6 pound. Caught on lures around talbingo. Hey Mate, I see in your report about the rubbish at Seven Gates, yeah, we struck it last Friday night, a whole camp full of the p??? ?, were agro we were fishing “their” bank, letting gas canisters go in the fire, and fireworks, roaring and yelling to be heard over the top of their s??? music going full blast, about 10pm they started doing circle work around our ute and bogging their 4 wheel drives, this s??? is going to cost the local economy and fisherfolk in general, one because decent people won’t go near the s??? hole they create and put up with their agro, two Hydro will start limiting the access with that going on. The bas???? had us over a barrel and they knew it , 10 against 2 equals a hiding everytime.................................next time we'll see. Just a heads up so you can give a word of caution to decent people of families looking to head there, looks like its turned to a mecca for f??????? ?.